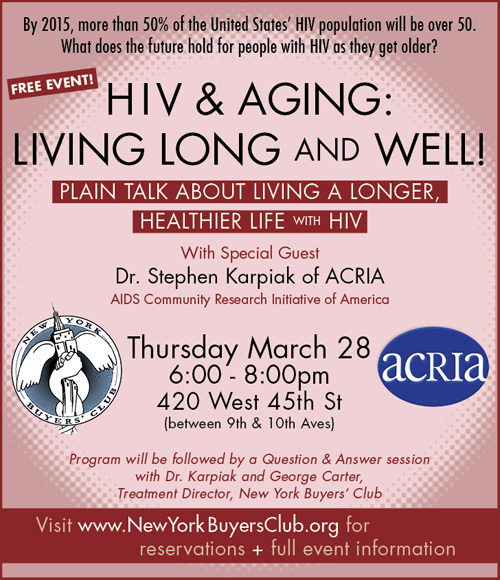 In 2007, NYBC began offering an alternative to the K-Pax multivitamin-antioxidant supplement, which was added to some ADAP and Medicaid formularies following publication in 2006 of Dr. Jon Kaiser’s study that found CD4 increases in people with HIV taking a micronutrient combination supplement. A first reason for the NYBC alternative, called the MAC-Pack, was price: for those without access to ADAP or Medicaid programs, the double strength K-Pax cost of about $140/month was rather high, and NYBC as a nonprofit co-op was able to present a close equivalent for only $62/month. But another rationale for introducing the MAC-Pack was its flexibility. In fact, because MAC-Pack uses the AMNI/Douglas multivitamins Added Protection as its core, it can be configured as a formula with or without iron. Having the option of an iron-free MAC-Pack is important especially to people with elevated liver enzymes, liver impairment, or hepatitis co-infection. Taking iron supplements is generally not recommended for this group, since processing the iron puts an extra strain on liver function. It was great to see an extended interview with our friend and colleague Fred Walters of the Houston Buyers Club in a recent posting on the website thebody.com. Fred talks about his conservative Catholic background, his early vocation that took him to seminary, and his subsequent adventures as he began and nurtured the Texas-based nutritional supplements purchasing co-op for people with HIV, the Houston Buyers Club. HBC has been a beacon for so many when it comes to information about, and access to, supplements. And treatment activists that we admire a great deal, including Nelson Vergel and Lark Lands, have found a welcome forum at HBC over the years–we’re all better informed as a result. If people are taking HIV drugs they have to take Coenzyme Q10, because what happens is that the drugs go into the body, as they’re winding their way through the cave with their guns drawn waiting to shoot at the HIV viral cells, by the time they walk up to a dead body they say, “Oh no, that wasn’t an HIV viral cell. That was a mitochondria.” And so Q10 helps to protect the mitochondria, and if you don’t protect the mitochondria in the body then you start opening yourself up to all kinds of organ and liver issues. “Oh, how could I forget this one. […] Actually it’s getting a lot of press locally because Baylor University is studying this, but … green tea capsules. We are seeing more and more people who are doing two grams a day of green tea capsules and their T-cells are going up between 40 and 100%. Dr. Christina L. Nance is studying that at Baylor and we see that here, and today I was watching a local television show and of all days for you to call, there was a show on about food as medicine and they talked a lot about HIV, and one of the things they talked about was green tea liquid. They mentioned that it was being studied locally for HIV. So we’re not the only one on the soapbox about this. We’ve seen amazing results with that. Ultra Preventive Beta This is a version of Added Protection that replaces the Vitamin A with beta carotene and a good mix of carotenoids–a good idea for people with any kind of liver trouble. Lipodystrophy has been one of the most discussed side effects of HIV medications in the past ten years, and, as this article points out, its potentially devastating psychological effects have added urgency to the search for scientific understanding about the condition, and treatment options to address it. Nelson outlines how Zerit and AZT were especially implicated in lipoatrophy; he also sorts through the ongoing uncertainties about the origins of lipohypertrophy and lipid abnormalities in people with HIV on HAART. This article is also very useful in reviewing the treatment options for these three conditions, including facial wasting reconstruction therapies like Sculptra (formerly Newfill) for lipoatrophy; prescription drugs for lipohypertrophy (testosterone or Metformin*); nutritional supplements like fish oil and Niacin for lipid abnormalities (these are often most successful when used along with diet and exercise programs, and can enhance the effectiveness of prescription statins). Nelson Vergel continues to do a great service in making this kind of treatment information available to PWHIV. For more info, you can also visit the website http://www.facialwasting.org, or subscribe to the pozhealth internet HIV health discussion group by sending a blank email to pozhealth-subscribe@yahoogroups.com. *See additional posts on this Blog for a recommendation about supplementing with B vitamins when taking Metformin. *See the recent post on this Blog for a recommendation about supplementing with B vitamins when taking Metformin.